Alexander's parents had prepared him well for his new role. Philip, who had spent part of his boyhood in Greece, wanted to pass on his love of Greek culture to his son. To do this, he hired the Greek philosopher Aristotle to be Alexander's teacher. From Aristotle, the future leader learned knowledge. From his father, he learned to be a fearless warrior. Stories say that Alexander slept with a dagger and a copy of Homer's Iliad under his pillow. As king, Alexander wanted to complete his father's plan to rule not only the Greeks and the Macedonians but the whole world. The world known to Alexander was eastern Europe, northern Africa, and western Asia. Trouble in his own kingdom delayed Alexander's plans. Neighboring peoples began to attack Macedonia along its northern border. Alexander had to make sure his homeland was safe before he could set out for distant lands. Alexander and his army defeated the invaders quickly. During the battle, however, a rumor started that Alexander had been killed. Hearing this, some Greek city- states rebelled against Macedonian rule. Alexander returned to southern Greece and ended the rebellion by force. In 334 B.C. Alexander returned to his dream of world conquest. He and his army crossed the Hellespont Strait between Europe and Asia Minor, attacking the Persian Empire, ruled by King Darius III. Alexander's army was made up of more than 35,000 well-trained soldiers. Asia Minor were forced to accept Alexander as their new ruler. After this, Alexander continued his bloody conquest. One by one, new peoples and places fell under his control. All across his growing empire Alexander the Great, as he came to be called, built new cities. Alexander named many of these cities Alexandria, after himself. The cities became centers of learning and helped spread Greek culture. In time Alexandria, Egypt, rivaled Athens as the center of Greek culture. Greek soldiers and settlers spread throughout the empire. 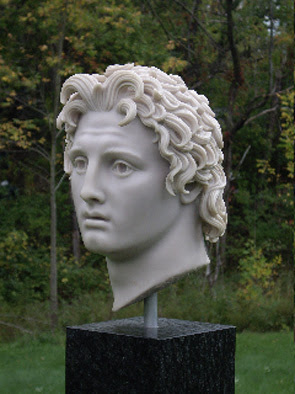 The different peoples of Alexander's empire learned to speak the Greek language and began to worship Greek gods. Because of this, the period of Alexander's rule and the next several centuries after his death became known as the Hellenistic, or "Greek-like," Age. Alexander's conquests made him the ruler of a multicultural empire, or an empire of many cultures. As the ruler of many different peoples, Alexander felt it was wise to adopt some of their customs as well as introduce them to Greek culture. This helped the Persians and other conquered people accept his rule. By 331 B.C. 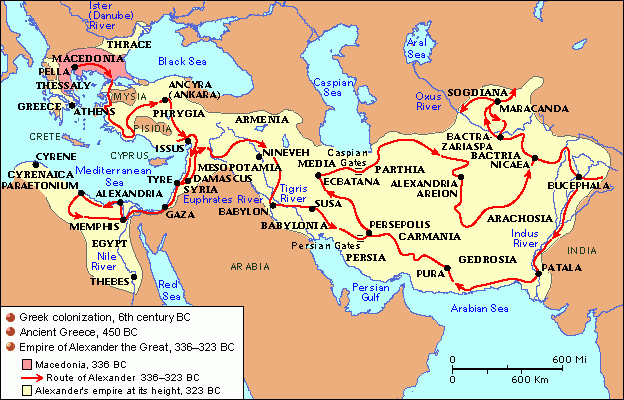 Alexander's empire stretched from the Danube River in Europe south to the Nile River in Africa, and from Greece east beyond the Tigris and Euphrates rivers in Asia. Alexander had conquered Asia Minor, Syria, Egypt, Mesopotamia, and other parts of the once-mighty Persian Empire all without losing a single major battle! How did Alexander build his empire?